Linda Boyd is not only an experienced and successful poker player, but a math teacher who’s aware of statistics. That is why get yourself prepared to hear lots of new and useful information about probabilities, statistic models and “mathematically correct way to play poker”. Every more or less experienced player knows that poker is not just a game of luck. Successful poker play is based on calculating odds and probabilities during game and choosing right action depending on your calculations. Linda Boyd will pass you through various aspects of game including choosing right hand to play, determining successful video poker type, making right bids and many more. Poker players will surely find interesting and even useful chapters concerning different casino types you can find in the country and strategies for main casino types. Linda Boyd touches such themes as poker etiquette and warns of possible addiction to the game. Even if you are an experienced player, you can skip these chapters and pay close attention to charts that break the light to poker strategies. These charts can be cut off and kept handy. 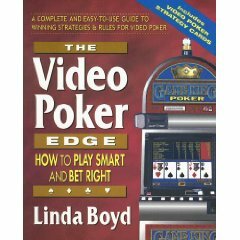 If you like video poker, you will sure this book interesting to read and useful while playing. Most of video poker players find no difficulty to win back the book price within a night.